This Wednesday is the 10 year anniversary of Patxi's Pizza, and they are doing a variety of promotions to celebrate. First off is free food and drinks (beer and wine) on June 4th from 3pm to 4pm at every location. Those wearing a Patxi's t-shirt to the party will get a $20 gift card. Also on June 4th, anyone who orders a pizza for delivery will get a Willy Wonka-style golden ticket that give customers a chance to win $25-$50 gift cards or the grand prize of "Pizza for a Year." Lastly, any children under 10 that have their birthday on June 4th will get a free pizza. Those lucky enough to turn exactly 10 years old on June 4th will win a pizza party valued at $200. Patxi's San Jose location is on the edge of Crescent Village at 3350 Zanker Road. Patxi’s Pizza, the Bay Area brand famous for classic Chicago-style stuffed pizza and authentic Italian thin crust, celebrates its 10th Anniversary on June 4 with celebrations around town, food and drink specials, contests and more. Patxi’s (pronounced pah-cheese. ‘t’ before ‘x’) began as a labor of love for old friends and now business partners William Freeman and Francisco “Patxi” Azpiroz. From their first location in Palo Alto, which is still operational, the duo has built the business into a successful, growing brand with twelve restaurants spanning two, soon to be three, states. With nine locations in the Bay Area, a thriving three-store operation in Denver, and plans to open in Seattle later this summer, Patxi’s is set up for an even more exciting ten years to come. Patxi’s invites customers and friends to join them for complimentary food and drinks (beer and wine) at every location in the Bay Area. Plus, Patxi’s will celebrate with cake and a toast for everyone. 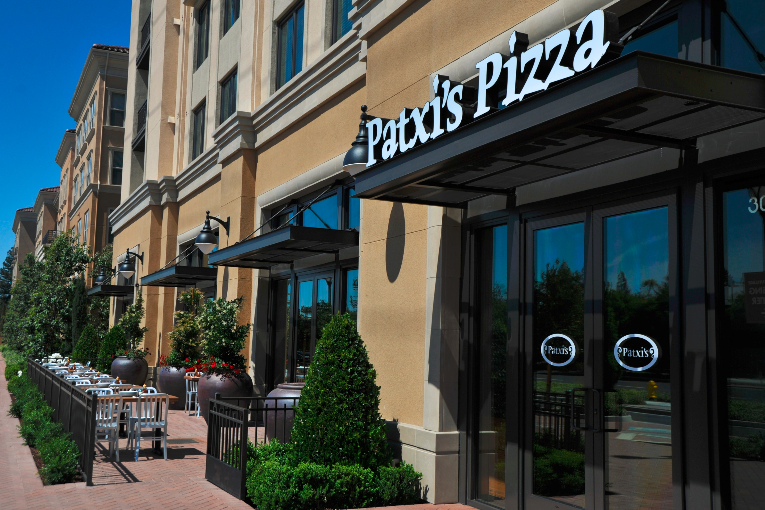 Those wearing a Patxi’s t-shirt to the party will receive a complimentary $20 gift card. Space is limited, event is first-come, first-served. Patxi’s isn’t leaving out their valued delivery customers during their anniversary celebrations. Everyone who orders pizza for delivery will get the chance to win big—Charlie and the Chocolate Factory-style. With each delivery on June 4 comes a “Golden Ticket,” guests can check their tickets value on Facebook to see what prizes they have won. Prizes include gift cards in $25 and $50 denominations along with a Grand “Pizza for a Year” Prize, valued at $500. Any child 10 and under also having a birthday on June 4 will receive a complimentary pizza (or gift certificate for a free pizza). Plus, any child also celebrating their 10th Birthday will win a pizza party celebration, value of $200. Plus, balloons for the kiddos at the grand celebration. For those customers participating in Patxi’s Loyalty Program, through Thanx, there are some fun anniversary specials as well. Thankx customers who dine at Patxi’s ten times during the month of June will receive a special VIP $50 reward. For details visit http://thanx.com/patxispizza. Founded in 2004 by two friends, entrepreneur Bill Freeman and pizza expert Francisco “Patxi” Azpiroz, Patxi’s Pizza offers authentic Chicago- and Italian-style pizza, featuring two distinct, handcrafted styles of dough, four types of mozzarella and over 30 different fresh meat and veggie toppings (ingredients sourced locally whenever possible). Patxi’s Pizza (pronounced pah-cheese) is privately owned and operated with a total of 12 locations between the San Francisco Bay Area and Denver, CO. Patxi’s Pizza was ranked #6 in the Food & Beverage Industry by Inc. Magazine’s Top 100 Hire Power Companies of 2013 and named among the Top 10 “Most Life-Changing Pizzas” of 2012 by Esquire Magazine. CEO Bill Freeman was recently named one of the “Most-Admired” CEOs in the Bay Area by the San Francisco Business Times. In addition to pizza, Patxi’s features an array of small plates great for sharing, including Burrata Bruschetta and the Meatball, which is inspired by a long-time Boston-Italian family recipe and features sustainably raised beef and a Chicago-style Italian sausage braised in a house made tomato sauce and topped with basil and Grana Padano cheese. In lieu of dessert, Patxi’s offers honey for the “bones” or crust of the pizza—the perfect way to enjoy those last remnants of crust after the meal. Guests can also enjoy fresh salads and beverages including a full bar. Complete menu is here. Photos available upon request. Through their 52 Weeks of Giving program, Patxi’s donates a portion of its profits to local nonprofit organizations dedicated to education and children’s health and welfare – totaling over $315,000 in donations to date. To date, the program has raised more than $315,277 for partner organizations with their shared mission. Since the program’s inception, Patxi’s has hosted just over 740 individual fundraisers for community organizations, nonprofits and schools. Over 397 community organizations participated in the program this year including a total of 128 local schools and in-school programs; and non-profit organizations such as the Make-A-Wish Foundation (Bay Area and Denver Chapters), The Leukemia & Lymphoma Society, United Autism Foundation, Children’s Hospital Oakland, Muscular Distrophy Association, and dozens more. Money raised through the program funded programs like a trip to Washington, D.C. for Lincoln High School, a 5th Grade Science Camp for Livermore’s Rancho Las Positas Elementary, and travel for the Team World Finals for Stanley Odyssey of the Mind among many others.